Mayor Alan Arakawa presents the Vision Zero proclamation last month in honor of Karl Hagen to his widow, Robin Hagen. In 2014, Karl Hagen was fatally struck while cycling on the shoulder of Piilani Highway. This tragedy, along with other traffic accidents, has started a critical initiative to bring a national campaign — Vision Zero — to Maui. The campaign is based on the idea that traffic deaths are preventable through coordinated engineering, enforcement and education. Designing roads to slow vehicles down and give people walking and biking safe alternatives will reduce the chance that a human mistake leads to death. On Sept. 15, Mayor Alan Arakawa presented the Vision Zero proclamation in honor of Karl Hagen to his widow, Robin Hagen. 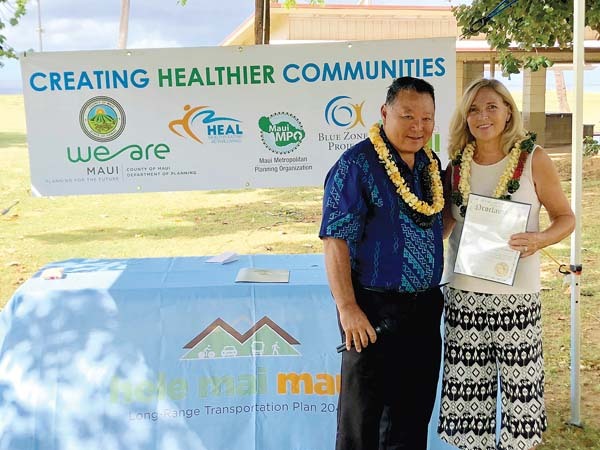 “The County of Maui continues to invest in Complete Streets and Safe Routes to School to encourage safe and active transportation in support of healthier communities,” Arakawa said. The event was followed by a 5-mile memorial bike ride through Kihei led by the Maui Bicycling League. Hawaii Bicycling League introduced Maui transportation experts and planners to the Vision Zero initiative just over a year ago, and since then Maui Metropolitan Planning Organization, Maui Bicycle League, Healthy Eating Active Living Coalition and the Blue Zones Project have partnered to carry this effort forward. Citizens, agencies and elected officials all play important roles in promoting road safety. 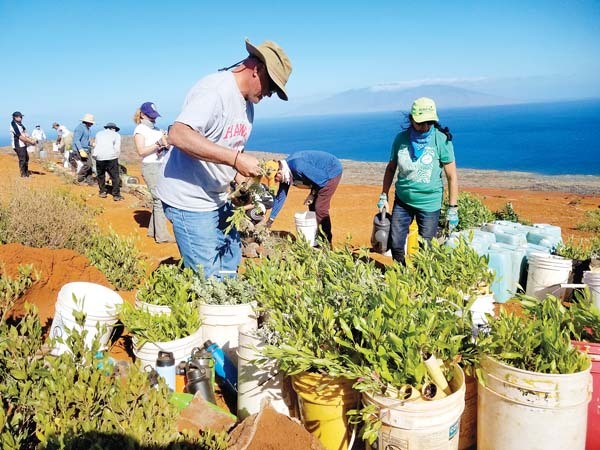 Funding for engineering solutions comes through state and county budgets — and for federal-aid projects, through the Maui Meteropolitan Planning Organization. The state Department of Transportation plans to improve pavement markings, signs and delineators on Piilani Highway. As a next step, Maui MPO will establish a Vision Zero Action Committee of people with expertise in transportation, enforcement, education, public health, emergency response, equity, biking, walking and vehicles. The committee will advise the Mayor’s Office and County Council on developing and implementing a Vision Zero Action Plan. For more information, visit info.bluezonesproject.com/cm/visionzero.